Increasingly, mines are using battery-powered electric vehicles underground as they help eliminate the problem of air pollution from diesel exhaust emissions. However, there is also an inherent risk in having large multi-battery charging bays underground. The charging process generates hydrogen, which escapes from the banks of batteries on charge to form a potentially explosive mix. This could result in a potentially catastrophic hydrogen gas explosion – constituting a very real health and safety risk in the process. In addition, in a ‘fiery’ mine such as a colliery for example, hydrogen combustion may potentially trigger a more serious secondary coal dust explosion. RTS Africa Engineering, based in Tshwane, specialises in innovative technologies that provide solutions to industrial challenges. Among other things, the company has been involved in supplying hydrogen production and analysis equipment for many years. The Hy-Alerta 500 instrument is a versatile handheld detection device, able to detect a wide range of hydrogen gas concentrations without the need for any peripheral equipment. The hydrogen sensor probe has a unique visual LED array that will effectively help navigate to the source of a hydrogen leak where hydrogen gas is produced, used, transported or stored. “With two sensing elements on the same semiconductor die, the Hy-Alerta 500 can detect hydrogen leaks as low as 15 ppm and will not saturate or be destroyed when detecting high concentrations of hydrogen up to 100%,” says Fraser. The Hy-Alerta 600B/610B fixed area hydrogen monitors are better suited for area monitoring; and will provide hydrogen-specific leak detection and measurement for hydrogen concentrations as low as 4000 ppm. They can, furthermore, be scaled to any concentration up to 5% hydrogen by volume, a range representing 10% to 125% of hydrogen’s low flammability limit. “This instrument can be connected to a flashing light or an alarm siren and, if need be, can communicate with a mine’s existing control system,” elaborates Fraser. Both models have been designed for either ceiling or wall mount; and have RS-422 capability that extends the interface from the sensor to the controller to over a hundred metres. “In addition, H2Scan’s hydrogen-specific sensor technology has no cross-sensitivity to other combustible gases, thus eliminating false alarms and increasing system reliability,” adds Fraser. He points out that the company’s hydrogen analysers and leak detectors are based on patented, solid-state core hydrogen sensor technology exclusively licensed from the US Department of Energy, and are supported by 15 years of research and development, and field verification work. In terms of occupational health and safety certification, H2Scan’s instruments conform to the highest international standards. For the past ten years, RTS Africa has been the agent – locally and pan-Africa – for H2Scan. 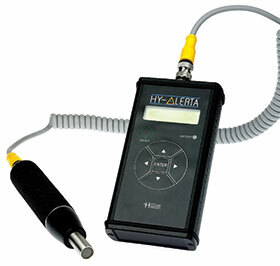 Many Hy-Alerta instruments are currently being used to detect hydrogen leaks around power station generators. “Ultimately, with the improved measurement capability provided by these solutions, industries such as mining and the petrochemical industry will be able to operate with the added peace of mind that the risk of hydrogen combustion has been eliminated,” concludes Fraser.